FNI: Down the Rabbit Hole and Special Guest! Start your weekend with a laugh! Friday Night Improv is a chance to catch some of the best local improv teams around. You never know what can happen in these unscripted shows. Down the Rabbit Hole are taking the stage to turn your suggestions into scenes with no rehearsed gimmicks or lines. This house team of The Mopco Improv theatre is coming hot off a fantastic show last month. Don't miss your chance to see them this April! It's a comedy show that can only happen once because they're creating it live, in front of your very eyes! Shortform improv consists of short scenes usually constructed from a predetermined game, structure, or idea and driven by an audience suggestion ... Longform improv performers create shows in which short scenes are often interrelated by story, characters, or themes. Will I get picked on by the comedians? Absolutely not. Improv is about getting inspiration from the audience to help us invent scenes and songs on the spot. We celebrate your contribution to the show because you are part of it. Any volunteers we ask to join us onstage we GUARANTEE will be 110% cooler than they were when they were in their seat. There are no minimum age requirements for attendees. Typically shows are within a PG-13 rating. Our performances are improvised so the content is largely determined by the audience and the suggestions you give. We don't avoid "blue" humor but we try to be a little more creative with off-color suggestions than the obvious. Do you have a late policy for seating? Yes. Our shows begin promptly. Please arrive 15 minutes prior to the start of the show. If a performance is sold out, unused tickets will be released to the waitlist beginning at five minutes to curtain. Please arrive early so that your ticket is not re-sold. Late arrivals will be seated at the discretion of theatre staff.There are no refunds within 24 hours of show time. Exchanges for a comparable performance can only be made up to two hours prior to a given performance. 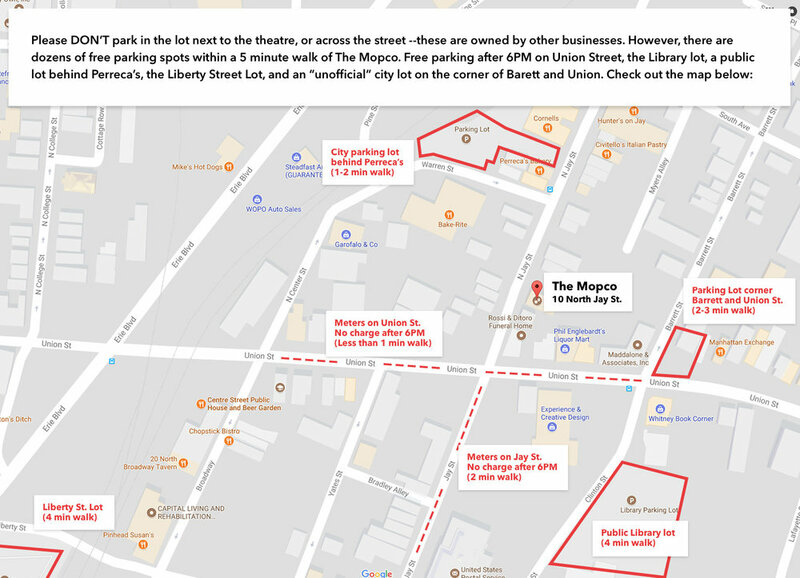 Street parking is available on Union and N Jay street by our Theatre. Parking is available in the lot behind Perecca's as well as other public lots within a short walk of the theatre. The lot directly across from us is reserved for the Rossi & Ditorro Funeral Home NOT AVAILABLE for parking. DO NOT park in the lot by JoJo’s Auto Service or you will be towed. Find our more and see a detailed map of parking options available around us here. You can reach us at hey@mopco.org with general inquiries or shows@mopco.org with specific questions about the show times and details. You can also call us at 518-577-6726. We’re also pretty good at getting back to your on Facebook messenger as well. Please contact us 24 hours before showtime to be eligible for a full refund.